High-quality components of Bosch, Shimano, Magura, and Schwalbe make the Sinuse-bike BC30 (Wave, 28 inches) a full-featured all-round e-bike, which guarantees a fatigue-free cycling even on longer distances thanks to its durable 500 Wh battery. The model with deep step-through is either available in black or in pale silver. 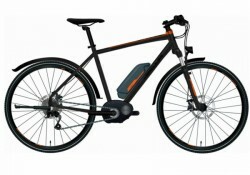 Kreidler e-bike Eco 8 Edition with Bosch Performance mid-engine and NYON, the first all-in-one eBike bord computer! 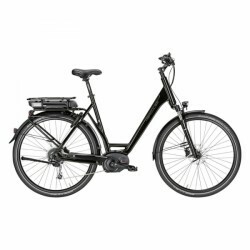 The Kreidler e-bike Vitality Eco 8 Edition NYON (Diamond, 28 inches) with Diamond frame and Shimano Deore XT 10 gears gear shift is a perfect mix of comfort and sportiness. With the full-of-drive Bosch mid-engine of the Performance Line and NYON, the worldwide first bord computer for e-bikes, which combines all functions in one device, each tour becomes a real pleasure. Bosch "all-in-one" bord computer NYON with navigation, fitness, and Internet functions! Agile cycling thanks to the powerful Bosch Performance CX engine with a maximum torque of 75 Nm! The special agile cycling of the Hercules e-bike Rob Cross Sport (Diamond, 28 inches) is based upon the Bosch Performance CX mid-engine, which offers a maximum torque of 75 Nm and outclasses all other Bosch motors with respect to power. The Bosch Performance CX engine already provides the high power at a low speed with slow pedal rotations. Hence, the Hercules e-bike Rob Cross Sport (Diamond, 28 inches) also meets the high requirements in steep terrain. Without a doubt, the Corratec e-bike C29er Trekking (Wave, 29 inches), by which you cope with any situation, sets new standards for cycling - either in traffic or on tours at the weekend. The worldwide safest Corratec e-bike frame (Fusion Tube Edge) offers a maximum safety and stability as well as the nonslip Continental 29'' tyres and the Trekking disk brakes of Shimano. "Fusion Tube Edge" frame design: the most stable and safest frame of Corratec! "Integrated Engine Technology" makes the complete integration of the Bosch motor possible; the engine protector serves as cover and protects from stone chips and other outer influences! Without a doubt, the Corratec e-bike C29er Trekking (Diamond, 29 inches), by which you cope with any situation, sets new standards for cycling - either in traffic or on tours at the weekend. The worldwide safest Corratec e-bike frame (Fusion Tube Edge) offers a maximum safety and stability as well as the nonslip Continental 29'' tyres and the Trekking disk brakes of Shimano. Note: The e-bike with a diamond frame is illustrated. This model is delivered with a wave frame. 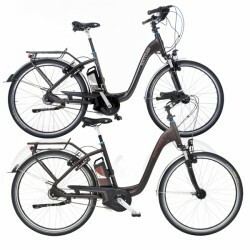 The Hercules e-bike E-Imperial S9 (Wave, 28 inches) is the perfect packhorse with a maximum permissible weight of 180 kg. Even at high loads, the Bosch Performance middle motor comfortably pushes when you start pedalling. 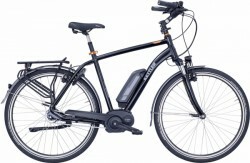 A speed of 25 km/h (until the pedalling support stops) is quickly reached with the Hercules e-bike E-Imperial S9 (Wave, 28 inches). 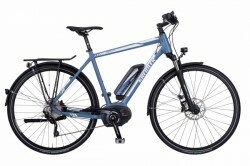 Note: The e-bike is illustrated with the Diamond frame. However, it is delivered with a trapeze frame. 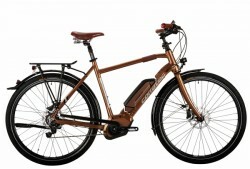 The Kreidler e-bike Vitality Eco 8 Edition NYON (Trapeze, 28 inches) is an e-bike for sporty cyclists and is suitable for sporty tours, trips to the workplace or a family trip. You easily conquer longer distances thanks to the powerful Performance drive of the company Bosch and the sporty Shimano XT derailleur. Besides the 10 gears gear shift originating from MTB and the strong hydraulic Magura disk brakes, a comprehensive comfort set completes the high-quality profile of the urban e-crossbike. Our purchase tip with respect to ergonomics and comfort! 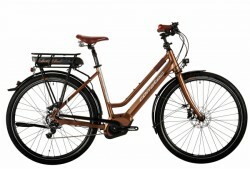 The addition "Ergo" is given to this Kettler premium pedelec, because it can be adjusted to the needs of a cyclists as precisely as hardly any other e-bike thanks to many ergonomically designed components (among other things, height adjustable handlebar, adjustable suspension fork, Ergon handles, Selle Bassano comfort saddle). Many ergonomic components are used (easily height adjustable handlebar - no tools required!, Ergon handles, Selle Bassano modular saddle with width adjustment, etc.)! Kettler e-bike with highest comfort! Get on and feel good – the new Kettler e-bike Obra Ergo RT (Wave, 28 inches) invites to go on comfortable city tours and long cycling tours thanks to the 500 Wh battery. The ergonomically shaped saddle offers a perfect sitting comfort. The handlebar is height adjustable and the handles fulfill highest haptic needs. Many ergonomic components are used (easily height adjustable handlebar thanks to quick release - tools are not required!, Ergon handles, Selle Bassano modular saddle with adjustment in width, etc.)! Get on and feel good – the new Kettler e-bike Obra Ergo FL (Wave, 28 inches) invites to go on comfortable city tours and long cycling tours thanks to the 500 Wh battery. The ergonomically shaped saddle offers a perfect sitting comfort. The handlebar is height adjustable and the handles fulfill highest haptic needs. Many ergonomic components are used (easily height adjustable handlebar, Ergon handles, Selle Bassano modular saddle, etc.)! The frame height describes the space from the middle of the bottom bracket to the end of the seat tube. This makes it the most important factor for sizing of your bike. The following chart gives a good indication for choosing the appropriate frame height. Measure your inner leg length/standover (from floor to the pace) and multiply it with 0.66. Trekking bikes and trekking e-bikes are perfect for all who want to go on longer tours. Cycle activitely with it and get support in pedalling. Trekking e-bikes have an integrated tailwind - so to say. Trekking bikes are especially designed for longer tours or a sporty cycling style. They have a smaller saddle than city e-bikes, which are mainly optimized for the everyday comfort. Trekking e-bikes also have a higher seat and you get a more bent sitting position. This makes you more aerodynamic and this posture gives a better gain in power while pedalling. Trekking e-bikes are especially interesting for groups who love to make a trip together into the countryside. When you cycle together with friends of different fitness levels, electric bikes can exellently compensate these differences. Those of the group, who are in best shape, just turn off the e-bike drive - or pedal slowly in a pre-set speed together with the group and enjoy the cycling tour. Of course, you can also make a trip on your own, i.e., cycling in the mountains ! Mountains offer great views, wonderful panoramas, and - unfortunately - one big flaw for cyclists: they are moutainous. Cycling tours in the mountains are a real challenge even for realy fit persons. This has fundamentally changed with pedelecs. Hills and ascents are easy to conquer now. Perhaps you want to try the infamous ascent to L'Alpe d'Huez in France or plan a cycling tour across the hilly vineyards along the Rhine. Just switch the motor of your e-bike one level higher for very demanding places and you arrive on top without overspending to enjoy a great view. Decide on your own whether you wish to renounce the electric motor for even track sections.